Musagetes, the International Institute for Critical Studies in Improvisation (IICSI), and the Laurier Centre for Music in the Community welcome Douglas R. Ewart to Guelph and Kitchener-Waterloo as our 2015 Improviser-in-Residence. Ewart arrived in Guelph in mid-September just in time to perform at the Guelph Jazz Festival, and will remain here until mid-November. In the Spring 2016 her will return for the launch of his Guelph-Kitchener-Waterloo iteration of the community project, Crepuscule. Perhaps best known as a composer, improviser, sculptor, and maker of masks and instruments, Douglas R. Ewart is also an educator, lecturer, arts organization consultant, and all around visionary. In projects done in diverse media throughout an award-winning and widely-acclaimed 40-year career, Ewart has woven his remarkably broad gifts into a single sensibility that encourages and celebrates, “As an antidote to the divisions and compart mentalization afflicting modern life,” and the wholeness of individuals in culturally active communities. 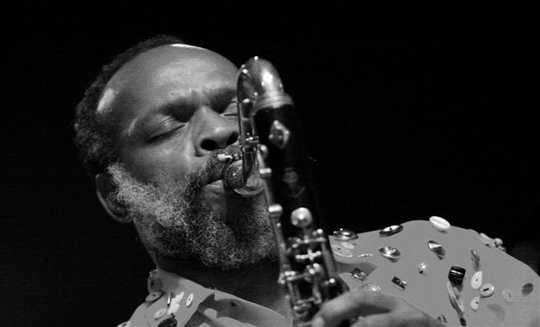 Ewart uses his past experience as chairman of the internationally renowned Association for the Advancement of Creative Musicians (AACM) to celebrate and build upon the history and achievements of the organization, and is from this perspective a natural extension of the activities he has been engaged in for the past four decades. Crepuscule builds connections across boundaries of culture, class, gender, and ethnicity. This long term project began in 1993 in Minneapolis, Minnesota as a commissioned work by the McKnight Foundation, called Wondrous Waters, based on a composition with an enormous group of people performing music, inspired by the sounds, acoustical properties, and possibilities that land and water provided. Mr. Ewart modified the idea from being just an orchestra with a relatively passive audience into an orchestra of community and activities, and an active audience, a microcosm of society where many disciplines could converge. Crepuscule events usually take place near a body of water, trees, or botanical gardens as a means to draw energy from the setting itself. The circle is imagined as a source of endless nature and power and persons collaborating in Crepuscule events join hands at some point as a demonstration of that power, unity, and community. “When people join hands, the circle becomes galvanized through the collective power of each individual,” remarked Mr. Ewart. He describes Crepuscule “as a space for all people to perform all kinds of creative art forms and disciplines.” This is a chance for curious artists, musicians, and folks of all ages and skill levels (novice to experienced) to connect casually over refreshments with Mr. Ewart and chat about the project. The agenda for the 2015 Improviser-in-Residence is to recruit a group of peoples from all walks of life to join in on the launch of Crepuscule in Guelph. The first phase of this operation is the Meet & Greet this Thursday, 24th (5PM-7PM). All interested parties are welcome to attend for formal / informal conversations about the project. Crepuscule will take place locally at an undisclosed location in the near future. Please attend our Meet & Greet if you are interested in joining in on Crepuscule in Guelph, 2015.